Sony Pictures has released a new preview for Spider-Man: Homecoming, which focuses on the primary villain Adrian Toomes, a.k.a. Vulture, and the salvage crew that works for him. Michael Keaton reveals he took a different approach to this character that most would consider a villain. The actor says he does "corrupt things" to fight what he sees as corruption, namely Tony Stark, whose government company known as Damage Control, which cleans up after all of the Avengers battles, essentially put Adrian Toomes' salvage company out of business. So Toomes decides to use all of the alien weaponry to fight back, building his own high-tech Vulture suit. This preview from Sony Pictures YouTube features interview segments with Michael Keaton, who explains that his character goes on this villainous quest because he sees the rich and powerful like Tony Stark who have it all, and he wants to know, "Where's mine?" Michael Keaton goes on to state that Adrian Toomes and his crew are all guys who "work with their hands," and since Toomes doesn't have any super powers, he uses technology to "up his game". 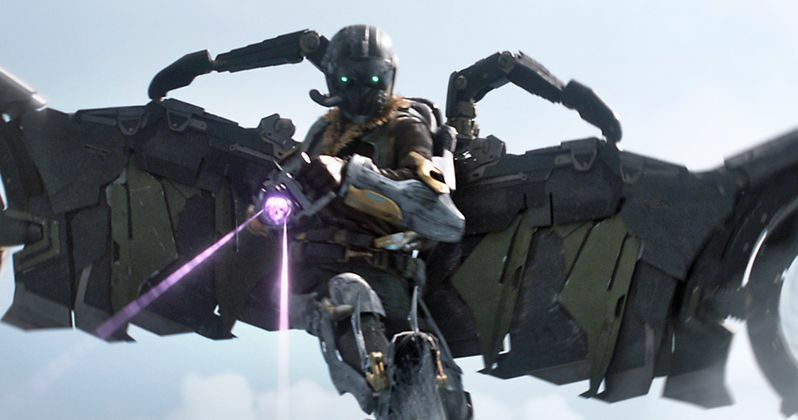 We also see new footage of Peter Parker trying to chase down Toomes' employees, Herman Schultz (Bokeem Woodbine) and Jackson Brice (Logan Marshall Green), the latter of which is seen firing a Chitauri weapon at Peter, as he's being dragged behind the fan by his webbing. This brief scene could possibly be just after a scene we recently heard about in an unconfirmed rumor, which surfaced from the novelization of Spider-Man: Homecoming, and also reportedly revealed the identity of Donald Glover's character. The novelization detailed a scene where Herman and Jackson are meeting a criminal named Alex, played by Donald Glover, who is trying to by some Chitauri weapons. Spider-Man breaks up the meeting, and chases after Herman and Jackson, who escape in a van, which seems to be the sequence we see in this scene. Another report, though, claimed that Donald Glover is not actually playing Alex, with an IMDB listing revealing his character as Aaron Davis, a.k.a. The Prowler, the uncle of Miles Morales. While we still haven't gotten confirmation from Marvel or Sony that Donald Glover is playing The Prowler, it certainly could set up some interesting developments in Spider-Man: Homecoming 2, which may or may not introduce Miles Morales. Marvel Studios president Kevin Feige recently confirmed that there is a Miles Morales lurking around somewhere in the MCU, hinting that this young character could certainly surface in future Spider-Man movies. Marvel has already confirmed a July 5, 2019 release date for Spider-Man: Homecoming 2, which producer Amy Pascal recently said will be set just minutes after the story of Avengers 4, arriving in theaters May 3, 2019. A young Peter Parker/Spider-Man (Tom Holland), who made his sensational debut in Captain America: Civil War, begins to navigate his newfound identity as the web-slinging super hero in Spider-Man: Homecoming. Thrilled by his experience with the Avengers, Peter returns home, where he lives with his Aunt May (Marisa Tomei), under the watchful eye of his new mentor Tony Stark (Robert Downey, Jr.). Peter tries to fall back into his normal daily routine, distracted by thoughts of proving himself to be more than just your friendly neighborhood Spider-Man, but when the Vulture (Michael Keaton) emerges as a new villain, everything that Peter holds most important will be threatened. Take a look at this new preview for Spider-Man: Homecoming, arriving in theaters exactly one week from today on July 7.